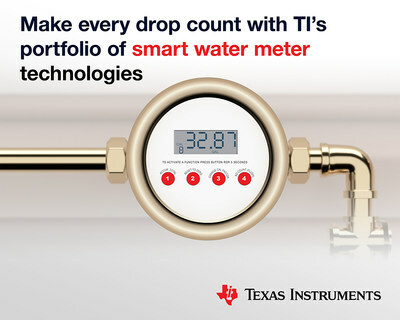 DALLAS, Sept. 26, 2017 /PRNewswire/ -- Texas Instruments (TI) (NASDAQ: TXN) today unveiled a new family of MSP430™ microcontrollers (MCUs) with an integrated ultrasonic sensing analog front end that enables smart water meters to deliver higher accuracy and lower power consumption. In addition, TI introduced two new reference designs that make it easier to design modules for adding automated meter reading (AMR) capabilities to existing mechanical water meters. The new MCUs and reference designs support the growing demand for more accurate water meters and remote meter reading to enable efficient water resource management, accurate measurement and timely billing. As part of the ultra-low-power MSP430 MCU portfolio for sensing and measurement, the new MSP430FR6047 MCU family lets developers add more intelligence to flow meters by taking advantage of a complete waveform capture feature and analog-to-digital converter (ADC)-based signal processing. This technique enables more accurate measurement than competitive devices, with precision of 25 picoseconds or better, even at flow rates less than 1 liter per hour. In addition, the integrated MSP430FR6047 devices reduce water meter system component count by 50 percent and power consumption by 25 percent, enabling a meter to operate without having to charge the battery for 10 or more years. The new MCUs also integrate a low-energy accelerator module for advanced signal processing, 256 KB of ferroelectric random access memory (FRAM), a liquid crystal display (LCD) driver and a metering test interface. For more information on the MSP430FR6047 MCU, see www.ti.com/MSP430FR6047-pr. The MSP430 Ultrasonic Sensing Design Center offers a comprehensive development ecosystem that allows developers to get to market in months. The design center provides tools for quick development and flexibility for customization, including software libraries, a graphical user interface (GUI), evaluation modules with metrology and digital signal processing (DSP) libraries. TI’s new Low-Power Water Flow Measurement with Inductive Sensing Reference Design is a compact solution for the electronic measurement of mechanical flow meters with low power consumption for longer battery life. Enabled by the single-chip SimpleLink™ dual-band CC1350 wireless MCU, this reference design also gives designers the ability to add dual-band wireless communications for AMR networks. Designers can take advantage of the reference design’s small footprint to easily retrofit existing mechanical flow meters, enabling water utilities to add AMR capability while avoiding expensive replacement of deployed meters. The CC1350 wireless MCU consumes only 4uA while measuring water flow rates, enabling longer product life. A second new reference design is an ultra-low power solution based on the SimpleLink™ Sub-1 GHz CC1310 wireless MCU. The Low-Power Wireless M-Bus Communications Module Reference Design uses TI’s wireless M-Bus software stack and supports all wireless M-Bus operating modes in the 868-MHz band. This reference design provides best-in-class power consumption and flexibility to support wireless M-Bus deployments across multiple regions. For more information, see www.ti.com/flowmeter-pr. Purchase samples of MSP430FR6047 MCUs from the TI store. Request an EVM430-FR6047 evaluation module online and download software via the MSP430 Ultrasonic Sensing Design Center. Low-Power Water Flow Measurement with Inductive Sensing Reference Design. Low-Power Wireless M-Bus Communications Module Reference Design. Download the "Ultrasonic sensing technology for flow metering" white paper. Read a blog post about ultrasonic vs. traditional metering. Watch our ultrasonic sensing video series. MSP430 and SimpleLink are trademarks of Texas Instruments. All registered trademarks and other trademarks belong to their respective owners.